And so now we come full circle. Do DSGE models incorporate Nietzsche’s Eternal Return? Federal Reserve officials expressed growing unease with the central bank’s easy-money policies at its latest policy meeting and some suggested the Fed might need to pull them back before the job market is fully back to normal. Minutes released Wednesday of the Fed’s Jan. 29-30 policy meeting showed that officials worried the central bank’s easy-money policies could lead to instability in financial markets and might be hard to pull back in the future. The Fed plans to evaluate how the programs are doing at its next meeting March 19 and 20. Some Fed officials suggested the Fed may need to alter its stated course to continue the bond-buying programs until the job market improves “substantially,” a threshold it hasn’t defined. This last reminds me that in the Minutes for the June 2008 FOMC meeting it came out that “the next move in rates will likely be up”! 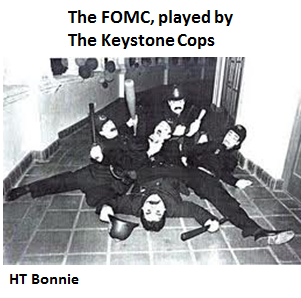 I hate to insult the Keystone Cops, but the FOMC bears an uncanny resemblance.